Properly known as Acute Necrotizing Ulcerative Gingivitis (ANUG), the more colorful name arose from its frequent occurrence among soldiers during World War I. Although not contagious, many soldiers contracted it due to a lack of means to properly clean their teeth and gums and the anxiety associated with war. Inadequate hygiene and high stress still contribute to its occurrence today, along with smoking, medications that dry the mouth and reduced disease resistance — all of which create a perfect environment for bacterial growth. ANUG can arise suddenly and be very painful. The cells in the gum tissue begin to die (“necrotizing”) and become swollen (“ulcerative”), especially the small triangle of gum tissue between the teeth called the papillae, which can appear yellowish. Patients also encounter a characteristic foul breath and taste. Untreated, ANUG can damage tissue and contribute to future tooth loss. Fortunately, antibiotics and other treatments are quite effective in eradicating bacteria that cause the disease, so if caught early it’s completely reversible. We start with a complete examination to confirm the diagnosis and rule out other possible causes.Â We then attempt to relieve the pain and inflammation with non-steroidal, anti-inflammatory drugs like aspirin or ibuprofen and begin antibiotic treatment, most notably Metronidazole or amoxicillin. We may also prescribe a mouthrinse containing chlorhexidine and mild salt water rinses to further reduce the symptoms. 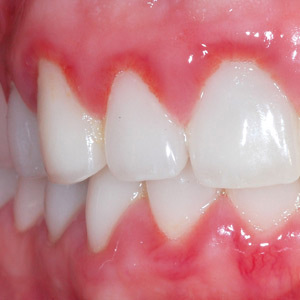 We must also treat any underlying gingivitis that gave rise to the more acute disease. Our goal here is remove any bacterial plaque and calculus (hardened plaque deposits) that have built up on tooth surfaces, particularly below the gums. Only then can we fully bring the disease under control. It’s also important you become more consistent and effective with daily brushing and flossing, quit smoking, reduce undue stress, and get better rest and nutrition. Establishing these new habits and lifestyle changes will help ensure you’ll never have to experience trench mouth again.